Google wants to limit the abilities of workers to organise — Google’s employees have captured international attention in recent months through high-profile protests of workplace policies. So Google has been quietly urging the US government to narrow legal protection for workers organising online. Seriously, it’s time to take control of your online profile! Meanwhile, US tech companies sell their surveillance services to dictators — The intermingling of privately sold technology and authoritarian regimes is hardly an outlier. But none of that gets China off the hook — Is China really using Huawei to hack the world’s communications? UK Wired thinks it’s not that easy to tell. The planet Earth — According to a survey of asteroid craters at least 10 kms (6.2 miles) wide, the number of asteroids slamming into Earth has nearly tripled since the dinosaurs first roamed. CO2 will be going up even more — The level of climate-warming carbon dioxide (CO2) in the atmosphere is forecast to rise by a near-record amount in 2019, according to the British Met Office. Not just plastic polluting the ocean: noise, too — That’s right: ship-mounted seismic guns firing at the ocean floor to find more oil. Just to get you in the mood: 9 movies about AI becoming self aware and killing us. MacAfee’s ‘unhackable’ storage was … hacked. Yep, computer programmer John McAfee released “the world’s first un-hackable storage for cryptocurrency & digital assets”, a US$120 device called the Bitfi wallet, that McAfee claimed contained no software or storage. McAfee was so sure of its security that it launched with a bug bounty inviting researchers to try and hack the wallet in return for a $250,000 award. Lo and behold, a researcher by the name of Andrew Tierney managed to hack the wallet, but … Bitfi declined to pay out! Facebook and the Myanmar genocide — Facebook announced it has banned several members of the Myanmar military and organisations that were named by the United Nations as complicit in the genocide. Way too slowly to do any good, of course. India’s biometric database is creating a perfect surveillance state — And US tech companies are helping. What’s Crap? Is OK, I will tell you: WhatsApp users on Android will be able to back up their messages to Google Drive for free and it won’t count towards Google Drive storage quotas … yay! But, as WhatsApp warns, those messages will no longer be protected by end-to-end encryption. Boo. How many days do Americans waste commuting? Educated Driver used Census Bureau data on average daily roundtrip commute times in hundreds of cities across the US to calculate how much time Americans spend traveling to and from work over the course of their lives, assuming a 45-year career working 250 days a year. Speaking of Americans, who got Cohen’s $50-thou? Cohen seems to have been a very busy boy, with legal documents showing he made a $US50,000 ($68,560) payment to an unidentified “technology company during and in connection with the campaign.” The unknown payment suggests Cohen may have been doing more for Trump, and for the Trump campaign, than simply paying off people Trump had been bonking on the side. Amid mounting acrimony with NATO, Russia’s military has announced plans to hold its “biggest exercises since 1981.” The country’s defence ministry says the massive exercise will involve some 300,000 Russian troops, more than 1000 aircraft plus the participation of some Chinese and Mongolian units. On health — In a dangerous twist to Ebola, outbreaks are starting to crop up in distant areas. It could already be the worst outbreak to date. Store-bought chicken could be causing UTIs — A new study published in mBio suggest urinary tract infections could be coming from Escherichia coli bacteria transmitted via poultry. China withholds flu data — For over a year, the Chinese government has withheld lab samples of a rapidly evolving influenza virus from scientists in the United States. Specimens are needed to develop vaccines and treatments, according to federal health officials talking to The New York Times. Pollution sapping our nutrients — According to new research, rising carbon dioxide levels will sap some of the nutrients from our crops and lead to dietary deficiencies in millions of humans. In 2014, field trials of common food crops including wheat, rice, corn and soybeans showed that as the amount of carbon dioxide in the atmosphere increased, the levels of iron, zinc and protein decreased in the dietary staples by 3 to 17%. This could have a big impact in poorer nations. Climate — We’re living in hell. 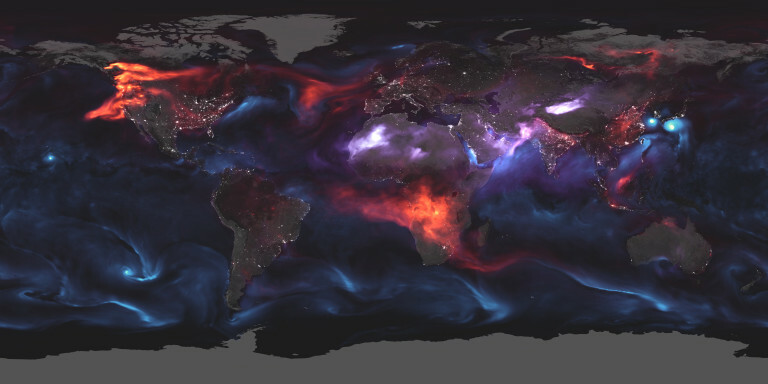 The image above, created by NASA’s Earth Observatory, has red representing soot, purple showing dust, and blue for sea salt. Central Africa is awash in smoke from farmers clearing land for crops. And those little glowing specks across China, the eastern US, India and Europe are cities where air pollution from cars and buildings is strong enough to create a clear signal to satellites. Air pollution is making us stupid — Air pollution causes a ‘huge’ reduction in intelligence, according to new research, indicating that the damage to society of toxic air is far deeper than the well-known impacts on physical health. [Ah, weren’t we stupid to create air pollution in the first place?] High pollution levels led to significant drops in test scores in language and arithmetic, with the average impact equivalent to having lost a year of the person’s education. On the lighter side — Police officers in Paraguay found that at least 42 of their battle rifles had been stolen from their armoury and replaced with toy replicas. It’s unclear if a flag with the word BANG! written on it popped out of the barrels.